From time to time a blog post will be added. Please let me know if you would like to write a post. Where did the weekend go? - it disappeared in a flash. Well done to everyone who swam, I remain impressed. We took the opportunity that the good weather gave us to ramp it up a lot this weekend. There were too many impressive swims to call them all out. To highlight a few we had numerous relay swimmers making their 2 hour qualifiers, our first 7 & 6 back to back from Deirdre, Guy Ridley turning the 3 hours set into 6, and many many swimmers swimming longer and further before. Because we've ramped it up, inevitably some found it physically and / or mentally tough - it's supposed to be, you're training to swim the channel (or similar). If it was physically hard, treat yourself to a massage - recovery is an important part of your training. If it was mentally tough - this is great training - better now than on the day - learn what you need to learn from it, draw a line and realise that you are now stronger because of it. Bank holiday selfie - looks lovely, it was blowing a gale! It's that time of the week again, time to reflect. I have been blown away by you all yet again. Great team work this weekend, and swimmers pushing beyond what they thought they would get (don't even bother trying to guess what I'll give you next!!) and voluntarily doing more than asked of them. Big congrats to those who did 6, only one went in intending to do it, but 3 ended up doing it - simply amazing! Vicky Miller did back to back 6's, incredible. Some relay swimmers did their 2 hour qualifiers, well done! Today was a different twist. It was blowing a gale and the air was really chilly. So I made it harder by telling the red hats they could choose what they wanted up to a maximum of 3 hours with no feeds. Given a legitimate get out clause you all chose wisely. Many pushed themselves to the full 3, some chose less given they're swimming later in the year. All good choices which will help you on the big day as the only person who will keep you in that water on that day is you - the motivation has to come from within. Well done all, see you next week!! I promised something different and fun today, I hope you enjoyed what we arranged! Thank you to Neil Streeter and Sam Jones (AKA team Suva) for supporting us, you were ace! 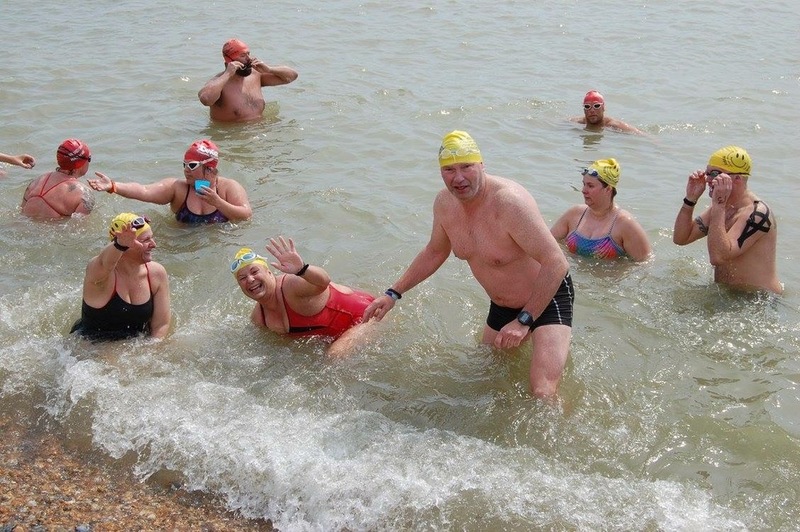 All relay swimmers were given the option to have a treat from the boat during one of their swims. I gave the soloists a choice - 2 X 1 hour with a treat from the boat or 1 X 1.5hrs with a cup of tea and and treat, I'm blown away by how many opted for 1.5 hours and did it, coming out with smiles. It was also fun having the German film crew with us, I hope you enjoyed your visit. I love the class of 2016!! If any of the other pilots want to join the fun one weekend you'll be very welcome! !